I simply can’t resist certain budget DVD sets. Throwing together a bunch of public domain movies in one ostensibly comprehensive collection for $5-$10? I’ll have at that all day. Granted, I draw the line at newer, no-budget, no-name horror/sci-fi/action collections, because I really, really don’t care. But compilations featuring classic movies and TV shows? Those are a severe weakness of mine. And I’m just fine with that. 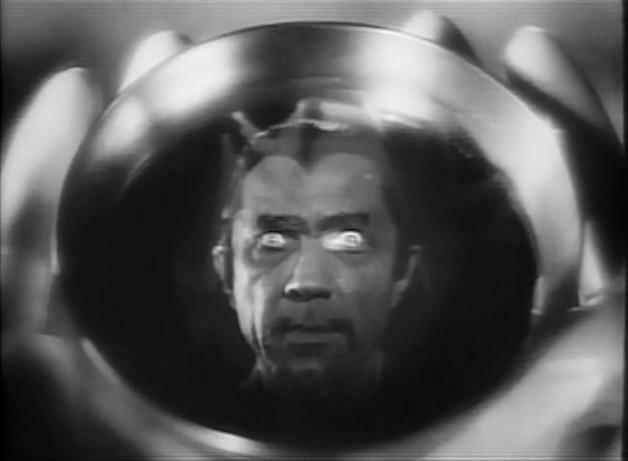 Just by taking a cursory look at the blog, it goes without saying that a premium is placed on those spotlighting the classic horror and sci-fi film genres. In that arena, we saw TGG Direct’s 3-disc Japanese Monster Movies set a bit over two years ago, and nearly a year ago (almost a year already?! ), we looked at Mill Creek’s The Best of the Worst, supposedly featuring the definitive worst movies ever made. Both of those comps were, and are, fun, and I continue to be fond of them. But our subject for today, this release, it’s just outstanding. I love it so much, and it was so cheap, that I seriously bought another copy just to keep sealed for collecting purposes. Not that I think it’ll really be worth anything in the future, but it’s so unabashedly cool, that having both a “watch” copy and a minty sealed fresh collectors copy, it just seemed right. No kidding, this may be my favorite “budget DVD set” ever, and I don’t say that lightly (I’ve got far more of these things littering my DVD collection than I care to admit). Why the extreme infatuation? 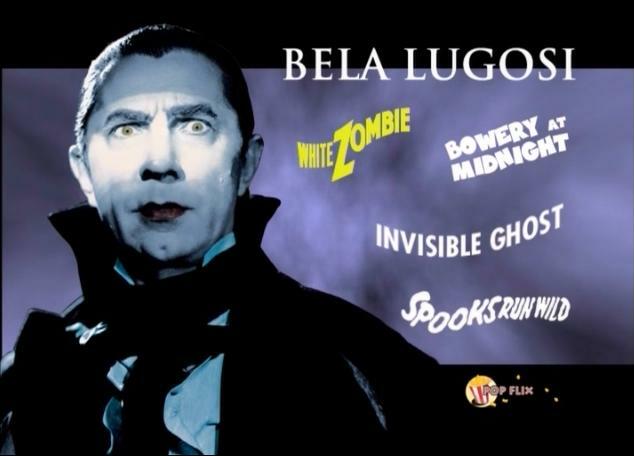 Because this set is dedicated to one of my top movie heroes, Bela Lugosi, that’s why! 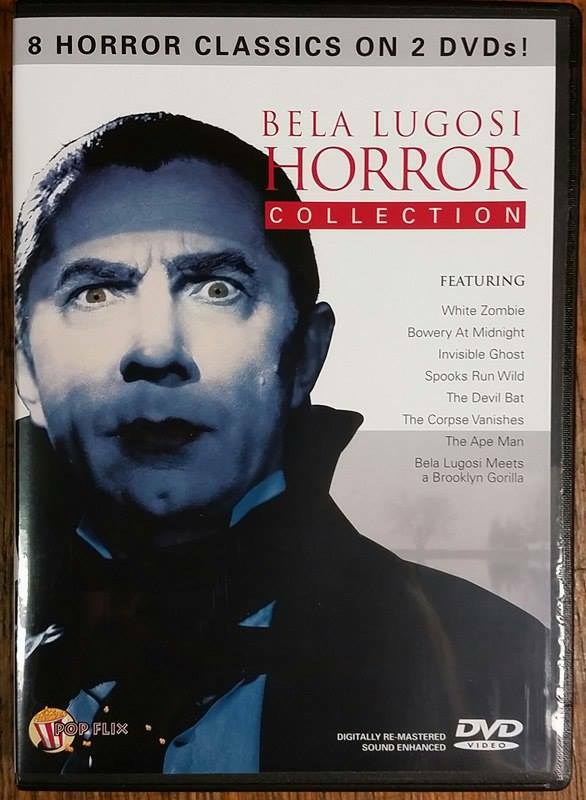 Released in 2009 by Allegro’s Pop Flix division, it’s an eight-movie collection primarily consisting of Lugosi’s 1940’s poverty row output, plus brief excursions into his 1930s and 1950s output. In other words, it’s a ridiculously entertaining set. Now granted, this isn’t exactly a revolutionary release. Most of the movies here are entries in Lugosi’s oeuvre that were made during his “B-Movie Period,” and subsequently lapsed into the public domain. (White Zombie being somewhat the exception; it’s the latter, but not the former.) That is, there’s been no shortage of DVD (and before that, VHS) editions out there, sometimes of individual titles, sometimes of compilations like this one. On that front, there are budget DVD sets that include far more of his public domain stuff than this one does. So why do I like this one so much? Well, there’s something to be said for a clean, concise package, and as far as I’m concerned, that’s exactly what this is. It’s obviously up to individual tastes, but for me, Pop Flix has left out a lot of the “chaff,” and kept a fairly strong line-up. As far as PD Lugosi flicks go, there’s really not a dud in the bunch. Sure, some are better than others, but all are entertaining. Personally, there’s not a “man, skip this crap” on here. And it all stars Lugosi – you just can’t beat it! Plus, I just really like the Pop Flix label in general. Their packaging, while still obviously in the “budget tradition,” is always clean and attractive (our subject above is a good example – kinda classy lookin’! ), and they tend to give you a lot of bang for your buck. These sets generally run between $5 to $10, and even at the extreme of $10, you get your money’s worth. Because they specialize (?) in PD material, image and sound quality will of course vary from feature to feature, but I’ve never seen anything unwatchable put out by them. Indeed, in my experience, you’re usually better off going with Pop Flix. They get my thumbs-up, and as we all know, my thumbs-up are of tantamount importance. There’s our line-up, and like I said, not a dud in the bunch. I love the inclusion of original poster art by each title, and the synopsis’ are, by necessity, short and to the point. My only complaint? I wish they would’ve added the original release date of each movie to their respective entry. It seems that’s a pretty common question whenever these releases are brought up. It’s a little amusing until I remember not everyone pointlessly knows the ins-and-outs of wildly obsolete films like I do. No, Dracula is not on here. Dracula will never be on here. These are public domain features; those without a valid copyright and thus can be distributed by anyone and everyone without having to pay a penny for the rights. Dracula is not public domain, nor will it ever be; Dracula is a Universal flick, and Universal doesn’t exactly play fast and loose with their film rights. To be honest with you though, Dracula really wouldn’t fit here; Dracula is almost too good, too big budget, to work with this line-up. It would look like the one ‘real’ film and then a whole bunch of filler. The exclusion of Dracula (not that it ever had a chance of inclusion) allows these to stand on their own; most of them are fun, low budget, poverty row films from a period when Lugosi was down and needed the work. These kept his name on posters and money in his pockets, and no matter how outlandish the material, he always gave the performance his all. His presence can (and does) take a movie that would be a waste with most any other actor, and utterly transforms it. This set is excellent in demonstrating that. Again, I like how concise this whole thing is. Eight movies, spread over two discs, and both are good. 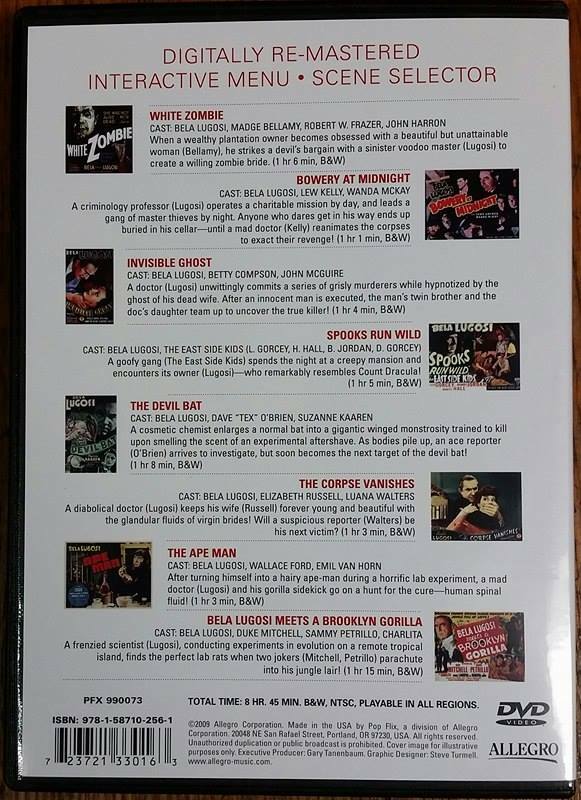 Sure, like any of these compilations, there’s a film or two that could have been subbed out for something you’re more fond of (I wish Scared To Death was on here, for example), but it’s hard to complain about what is included. None of these are masterpieces, but they’re all wildly entertaining, and with most only clocking in at a bit over an hour, watching more than one in a single sitting is totally doable, especially at only four films per disc. Rather than go with some mini-digipacks or a double-wide case or some such nonsense, both discs are housed in a single standard DVD-case, one per side. I like that. Doesn’t take up any extra space on a shelf, while still retaining the clean, attractive design of the whole thing. I dig it! So, what about the picture and sound of the collection? Like I said before, and like any of these sets, they’re both going to vary from feature to feature. Now, if you scroll back up to that front cover, you’ll see the claims of “Digitally Re-Mastered” and “Sound Enhanced.” Sound-wise, this set actually exhibits pretty good sound quality. I’m not sure what exactly “Sound Enhanced” entails, but I could hear everything, which isn’t always the case with thousand-year-old movies like these. As for the picture, it definitely varies, but it’s uniformly watchable. Oddly enough, the whole thing appeared considerably clearer and sharper when viewed on my old CRT TV than it did when taking the forthcoming screencaps on my PC. I’m not sure where the variation falls, or what the true representation of quality is, but either way, you’re still getting your money’s worth. Besides, these are the kind of films that really should be viewed on a good ol’ CRT TV – seems so much more ‘authentic’ that way. Speaking of authenticity, the prints used do indeed exhibit dust, dirt, scratches, splices, and so on throughout. Occasionally the picture is too dark or too light. These were digitally remastered in some way, perhaps, but don’t let that fool you into thinking these prints look substantially different from other budget releases. And guess what? That’s a good thing; it totally plays into the vibes of the set. “WAIT, you don’t want these as HD restored Blu-rays and whatnot bro?” Look, that’s missing the point. Okay, yeah, restored and cleaned up is of course always nice (Kino’s big deluxe The Devil Bat is definitely on my want list). But, with a collection like this, mainly representing Lugosi’s poverty row period, all the scratches and crackles and splices, they just totally evoke watching this or that at some local theater back in the 1940s or on some local UHF TV station decades ago. Clean these up all you want, it’s understandable and necessary, but there’s something to be said for being able to see the accumulated trips through the projector these prints took for who knows how long. Pristine? Not at all. Fun? Definitely. Evocative of the time period they came from? Absolutely. The main menu for each disc is basically the same, with only the movie selection changing (“gee, you don’t say!”). Clicking on any title will bring you to another menu with options to play or select a scene, plus a bit of poster art. Don’t go in expecting audio commentaries or deleted scenes, alright? You’ll get your scene selection and you’ll like it! Like the packaging itself, the menus are clean and to-the-point. I dig the bluish/purplish color scheme. So, the first disc. It’s really good, but relatively speaking, the weaker of the two. With eight films to cover, I don’t want to go extremely in-depth here, lest this become a three-day read, but we’ll briefly check out each one included. I’m a rebel that way. Things kick off with 1932’s White Zombie. Unlike the other films in this set, this was made in the more-immediate aftermath of Lugosi’s Dracula triumph. It’s not a Universal film, though it was filmed on the lot. This was an indie production, and for whatever reason, eventually wound up in the often-murky arena that is the public domain. Without a doubt, this is the most critically-acclaimed film in the set, with some people absolutely adoring it. I can’t claim to have ever been one of those people. Oh, I like it fine, there’s not a film in this collection I don’t like to some degree, but I was just never as enamored with White Zombie as others were/are. 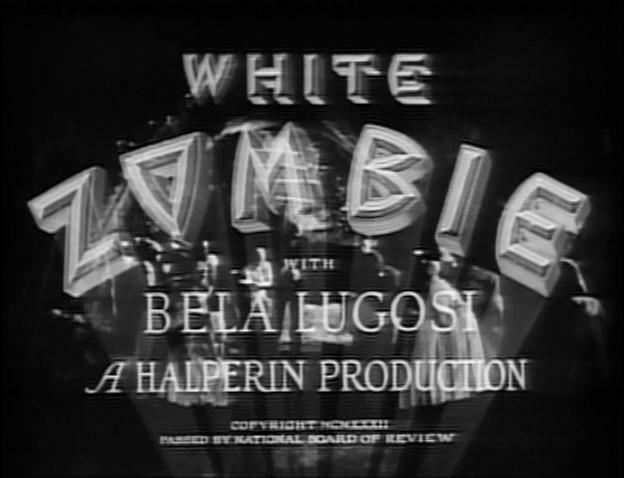 It has a great, almost Universal-like atmosphere, but the acting (besides Lugosi) isn’t all that wonderful, and even though this is apparently the first-ever zombie film (these ain’t your George Romero’s zombies, though! ), the plot still leaves me a little cold. Set in Haiti, Lugosi plays “Murder Legendre,” a whiz at the voodoo he does so well (hence, whiz). With a first name like “Murder,” you can probably surmise he’s not the nicest of fellas. Murder is pretty good at creating “voodoo-brand zombies,” (those are the kind that don’t eat your flesh), and indeed, he’s got a whole league of them. A bad situation is made worse when the local plantation owner makes eyes at young bride-to-be Madeleine. Through Murder’s powers, she is turned into a zombie (on her wedding night, no less), and it’s up to her new-hubby Neil to save her and stop Murder once and for all. It’s not a bad movie, just not one that I ever loved as much as others do. Kind of like my weird Dracula analogy a bit ago, White Zombie almost sticks out as “too competent” here; it almost doesn’t fit with the rest of the cheapies in the set. It winds up skirting the issue, though I’d be hard-pressed to explain why. Maybe it has less to do with anything the movie itself does and more to do with the subsequent mega-public domain status it has acquired in the home video era. No kidding, it seems nearly every budget outfit had a release of White Zombie to call their own. Or maybe it’s just because it’s a good, fun film. It’s not a great film, but that helps it fit in better than it should. I guess. Naturally, I had to take at least a cursory glance for this review. As it turned out, while I may indeed have had a copy already (probably on another budget DVD set), I’m almost positive I’ve never actually watched it. In short order, I found myself becoming absorbed in the movie, quite unexpectedly on my part. Bottom line: I loved it. 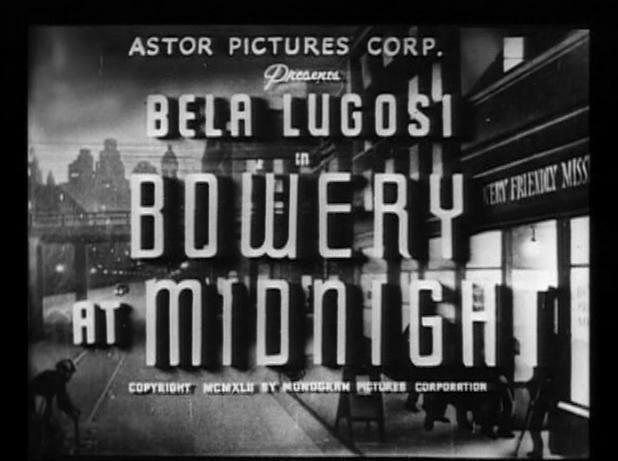 No joke, Bowery At Midnight instantly found a place in the upper-echelon of my personal favorite “Cheap Lugosi” flicks. We’re talking a top-five’r here. This is just good, solid poverty row entertainment. I wasn’t totally off in my initial assumption regarding the movie. It is, for the most part, a crime thriller. But, there’s a surprising, legit horror twist that’s too random to not love. 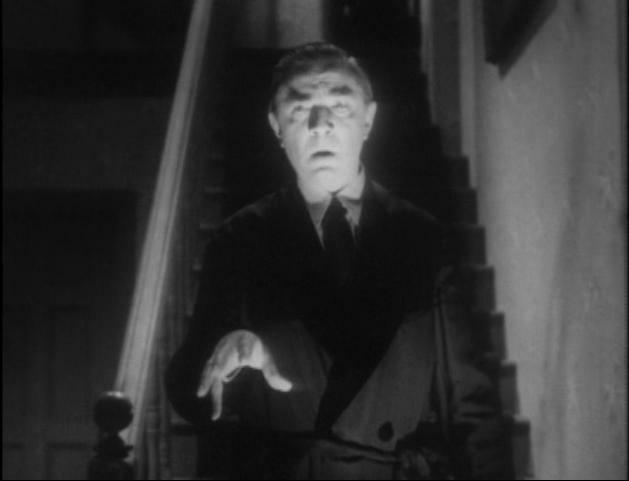 Lugosi has a sort of dual-role here, though it’s really the same person: by day, he’s college professor Brenner. By night, he’s Karl Wagner, who runs a soup kitchen at the Bowery. Despite putting up a friendly facade (heck, the name of the soup kitchen is “Friendly!”), the whole thing is a front for Wagner’s life of crime; he has a habit of enlisting rough-types that wander into the kitchen for local heists, and then later offing them (often at the crime scene, no less) when they’re no longer of use. Naturally, you can only get away with that for so long before the cops start to piece it all together. Where does the horror aspect come in? Hanging around Wagner’s secret hideout in the basement of the mission is one Doc Brooks. Doc likes to take the corpses Wagner leaves behind and use them for his own experiments. Eventually, it’s revealed he’s reanimated them as zombies! Honestly, the whole Doc character/horror aspect feels completely tacked-on, but it still, somehow, fits. Though, I’m the first to admit I don’t quite get the ending. (CAUTION: spoilers for a 74 year-old movie ahead!) Near the end, the boyfriend (Richard) of Wagner’s employee (Judy) at the mission is shot dead by Wagner himself, and his body given to the Doc. At the conclusion, after Wagner is defeated, Richard is seen rescued, alive and well and engaged to married! Say what? Were these guys not really dead? Or does Judy just not care, since he’s up and talking? He appears perfectly fine, so yeah, I don’t get it. Which of course means I love the movie all the more. Even with guys gettin’ shot and zombies and weird ending and so on, this all still manages to attain an early-1940s movie innocence. If you haven’t seen Bowery At Midnight, try to check it out! 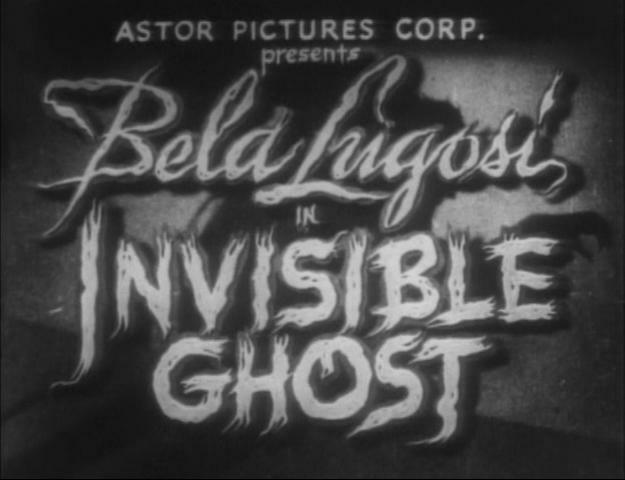 Fun fact: we almost saw 1941’s Invisible Ghost here at the blog before. Y’see, a month or two back, I got in a real horror hosted-Lugosi mood. As longtime readers know, back in the late-90s and early-2000s, when I was first discovering all these movies, I was an avid watcher of The Ghoul, and two choices via his show popped into my head: The Devil Bat, and this film here, Invisible Ghost. Now, whenever I review something like that, it’s from one of my old VHS recordings, and a good deal of the time, I haven’t converted it to DVD for posterity yet. So, no time better than the present! (Plus, it makes grabbing screencaps and going back-and-forth for whatever reason easier.) Problem that time was, I was either running low or down to my last blank DVD-R. Another pack required a trip to the store and spending money, neither of which I felt like. So, I had to pick between the two. As it turns out, I chose incorrect. I made the DVD conversion and got as far as some preliminary writing before I realized the material just wasn’t really suited to a post. It would have turned into a plain movie review with some token looks at the Ghoul segments. I tried, but nothing doing, so I scrapped it. The movie didn’t give me a whole lot to work with, but that doesn’t mean it’s bad. The title makes it sound more ‘spooky’ than it really is though; It’s more of a psychological thriller than a full-fledged horror film to me. Bela plays “Charles Kessler.” Kessler’s wife has left him, some time prior, and is presumably later killed in a car accident. She’s not actually dead though; she’s been hidden away in the basement by the gardener. Every once in awhile, she’ll ‘appear’ to Kessler, which then puts him in a murderous trance. Yep, Bela kills without really knowing that he’s killing. Like I said, not a bad film, and prior to falling in love with Bowery At Midnight, *I* would have considered it a stronger ‘second-tier’ film here. As it stands though, this, for me, is one of the weaker entries, though that’s really only relatively speaking; this is still a good one, but it’s a bit overshadowed by some of the other flicks here, in my eyes. 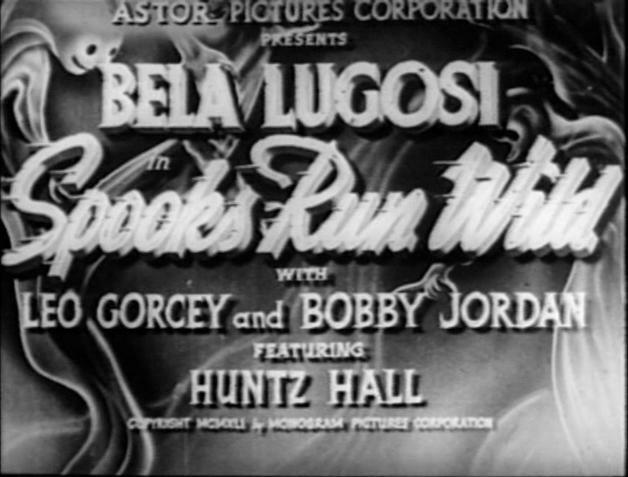 1941’s Spooks Run Wild finishes up the first disc. This is one of those Bowery Boys/Bela projects I mentioned earlier. Technically, this is an East Side Kids film, which is fine with me. Of the whole Dead End Kids/East Side Kids/Bowery Boys lineage, the East Side Kids entries were always my favorites. If you’ve seen an East Side Kids flick, you can probably guess how a lot of this plays out. Muggs and his gang (The East Side Kids, man!) are New York street toughs; not really bad, just mischievous. In this entry, they’ve been tricked into attending reform camp. Naturally, they don’t hang around there very long, and upon splitting, they wind up at a “haunted” house. To make matters worse, a mysterious killer is on the loose. 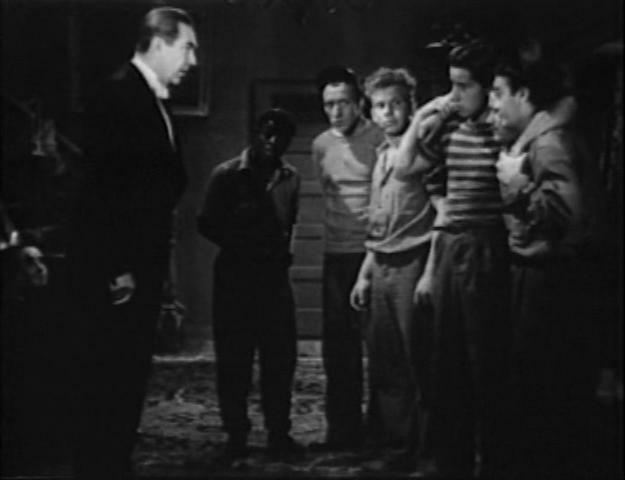 Wacky East Side Kid situations then ensue, only this time with Bela Lugosi in the vicinity. Lugosi plays Nardo, who is assumed to be the killer, though in a nice change of pace, he’s not; he’s actually a magician! 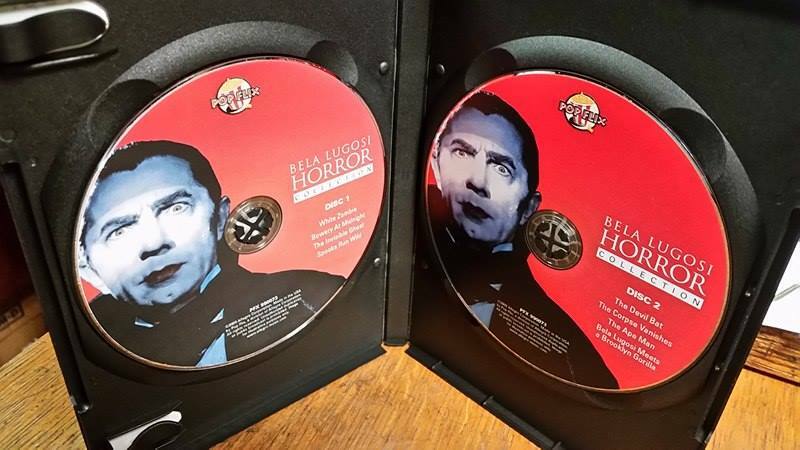 Also, as the back of the DVD cover correctly points, Bela’s Nardo looks a lot like Dracula. For all you “Where’s Dracula?? ?” folks, there’s your precious, precious Dracula! And now we come to the second disc. Look, this whole set is good, but man, disc two is worth the price of admission alone; this is the cool winnins of the set! Just look at that powerhouse of a line-up above! 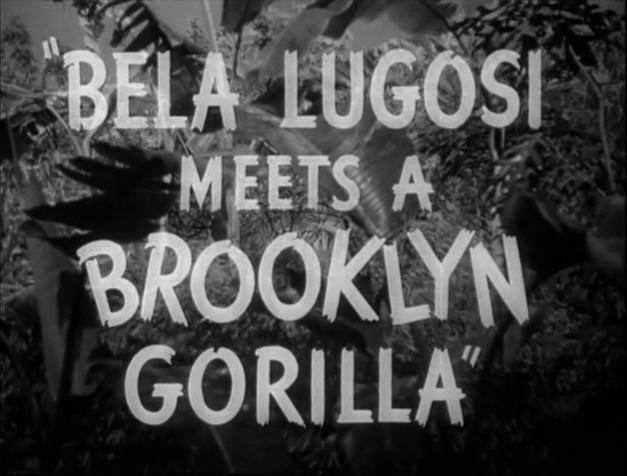 Okay, Bela Lugosi Meets a Brooklyn Gorilla, that’s relatively “meh,” but those first three, all in a row like that? That’s where it’s at! Remember when I was gushing about Bowery At Midnight, and I mentioned that top five thing? Yeah, those first three movies on disc two are easily in my top five. In my humble opinion, there are no better examples of Lugosi’s poverty row output. I’ve got to do a little backtracking here: if you’ll recall this terrible old post, you’ll know I was a little lukewarm on the subject of 1940’s The Devil Bat. Apparently it didn’t do too much for me when I first saw it years ago, and I was still riding on that. Well, intelligence allows for a change of opinion. In the years since that post, I’ve become more and more fond of The Devil Bat. It’s cheap, cheesy, and ridiculously entertaining. You just can’t hate it! Unlike most of the movies on this set, which were Monogram productions (often through their Astor Pictures division), The Devil Bat is a PRC product (that’s Producers Releasing Corporation, folks). Despite the ubiquity of Monogram in the era, PRC is the studio I think of first when I think “poverty row movie.” They made some cheapies, that’s for sure. Immensely entertaining cheapies, though. I’m not the only one who thinks there’s some merit to this film, either. Kino took the time released a remastered Blu-ray edition, and there’s even a newly colorized version of the movie out there! No one will claim The Devil Bat to rank among Bela’s most accomplished work, but obviously there’s something endearing about it. You know a film is worth checking out when Kino deems it worthy of a release! And, unlike Invisible Ghost, there’s now a very strong possibility we’ll see The Ghoul’s showing of this episode at some point in the future. Because I’m now seriously planning on reviewing that old Ghoul episode, I’m not sure how much I want to divulge about the film right now. But then, this flick is so whacked-out (in a good way), I suppose a whole lot isn’t needed to sell this one. Listen to this beauty of a plot: Lugosi is Dr. Carruthers, who has an axe to grind with the cosmetics company he works for. And just as any reasonable person with a grievance would do, he follows the obvious path of creating a big mean giant bat. What, that’s not enough? Okay, how about this: he also develops a special aftershave lotion that, when worn by a chosen “test subject,” attracts said big giant mean bat (“The Devil Bat,” as quickly labeled by the press), which of course then kills the aforementioned aftershave-wearer. Yes, this means you get to see a helpless victim thrashing about under a gigantic rubber bat. And if that’s not enough to make you want to see this movie, well, then I just don’t know. No kidding, this one is fantastic. I can’t believe I went so many years not loving it! 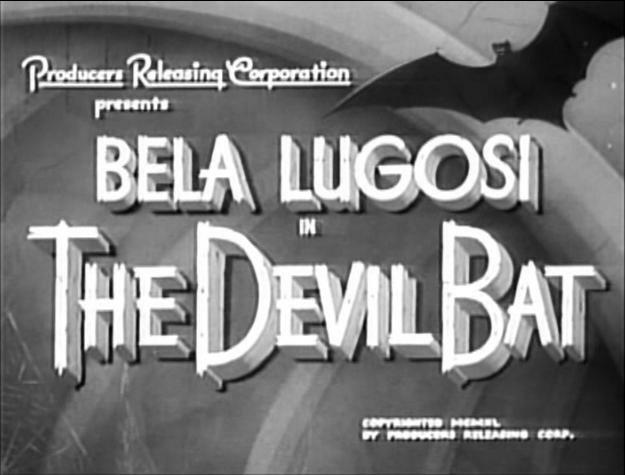 Fun fact: there was a 1946 sequel titled Devil Bat’s Daughter, which, as of this writing, has been seen by approximately 12 people since its release, and doesn’t star Bela. No Bela? Pass! Saaaay, haven’t we looked at this one before? We sure have! I kicked 2016 off with not only a review of this movie, but also Al “Grampa” Lewis, who hosted it for Amvest Video back in 1988. I go way back with 1942’s The Corpse Vanishes; it was of the first episodes of The Son of Ghoul Show I saw back in 1997 (I taped it, but unfortunately didn’t keep it – d’oh! ), Mystery Science Theater 3000 tackled it once, I have a partial recording of the movie on Enigma Theater somewhere, and there were probably some other instances regarding it I can’t even recall right now. 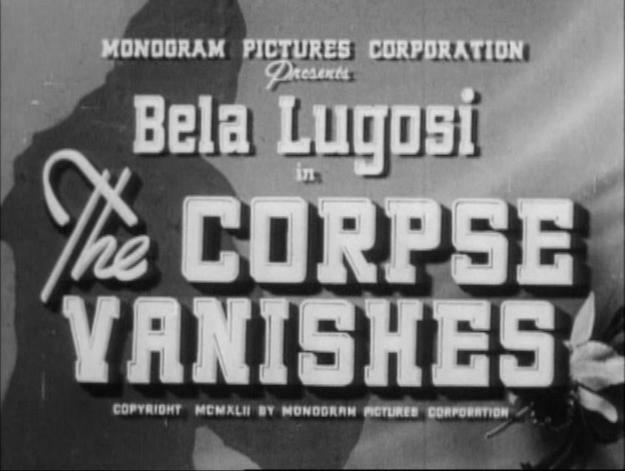 The public domain-status of the film (plus the not-as-lurid-as-it-sounds-but-still-pretty-cool title) ensured that The Corpse Vanishes really made the rounds in the decades since it was originally released. I want my Grampa / Amvest Video review to be my definitive (ha!) 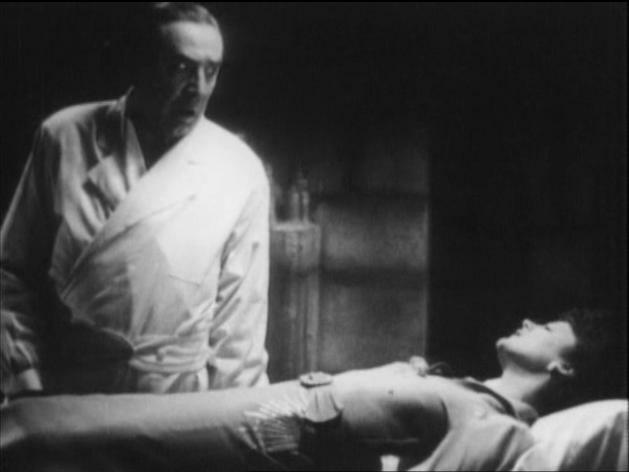 take on the movie, but real quick: Lugosi plays “mad botanist” Dr. Lorenz, who uses specially-formulated orchids to put prospective brides into a death-like state (on their wedding day to boot!). 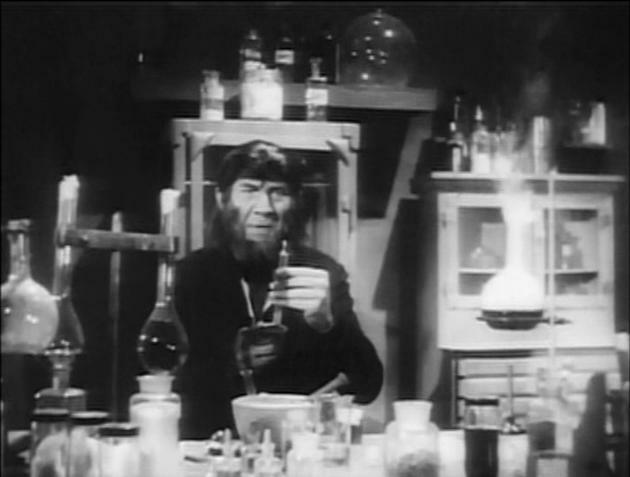 The brides are then spirited away to his laboratory, where special fluid of some sort is extracted and injected into Lorenz’s aging (and mega-bitchy) wife, in order to rejuvenate her. Reporter Patricia Hunter soon gets on his trail and helps put an end to such shenanigans – but not before we get to see Lorenz and his wife sleep in a cool pair of coffins! The Corpse Vanishes is less overtly-wacky than The Devil Bat, but in its own way, just as much fun. As the years have gone by since I first saw it, I’ve only grown to appreciate it more and more. Fun fact: a poster for this movie is plainly visible in the background at one point in Bowery At Midnight! Aw Monogram, you playful folks you! We’ve seen this one here before, too. Do I get around or what! 1943’s The Ape Man was included on that Best of the Worst DVD set I linked to earlier. The title-screen here seems to have some sort of weird border/cropping around it (Bowery At Midnight did too – what’s it mean??? ), though that’s a small price to pay to watch Bela walk around in a perpetual half-ape state. This movie is fantastic. It manages to out-goofy The Devil Bat, which is really saying something. I can see similar movies being released in the 1930s, and the 1950s, and even beyond. But the sheer nutbar matinee innocence that rampages across the screen here? It’s a movie that really could have only come out in the 1940s. Oh how I love this one. 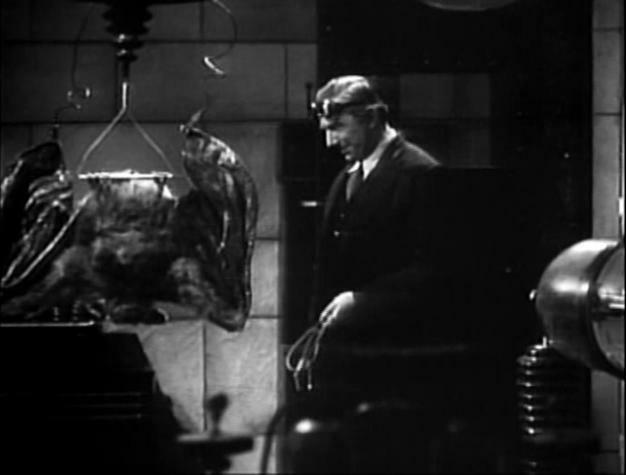 Bela is Dr. Brewster, who has been messing around with apes. Wait, that sounds weird. I meant scientifically. Hold on, that still doesn’t sound right. He’s been experimenting on apes. There, that’s better. And guess what? By doing so, he’s turned himself into the titular character! This is an undesirable affliction for at least 6000 reasons, so it’s up to him and his pet real ape (and by “real” I mean “very obviously a guy in a suit”) to kill people for their spinal fluid, which will turn him back into a full-human or some crap like that. It doesn’t really matter, because this movie is too insane to take seriously, which of course makes it absolutely terrific. Also, secret special bodily fluids as a plot point again? Was that like the hot scientific whatever back in the 1940s? We saw it in The Corpse Vanishes, and here it is again. And three years prior, Monogram went this semi-route with Boris Karloff in The Ape, which also focuses on spinal fluid as a vital element. The stuff must be the fruit punch of bodily fluids! Wait, that sounds weird, too. Louise Currie plays the female lead, a photographer, and she’s cute as a button. 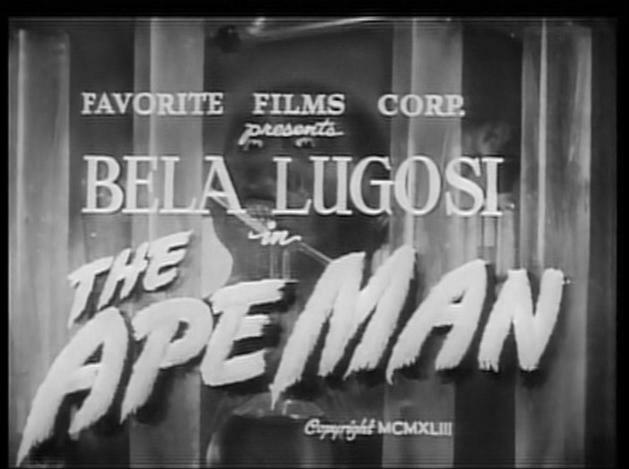 Fun fact: there was a 1946 1944 sequel titled Devil Bat’s Daughter Return of the Ape Man, which, as of this writing, has been seen by approximately 12 8 people since its release, and doesn’t does star Bela. No Bela? Pass! Has Bela? Worth a glance! After that phenomenal three-pack that takes up a full 3/4 of this second disc, there’s really nowhere to go but down. Even my personal choice of Scared To Death would have seen a drop in quality (ha!). 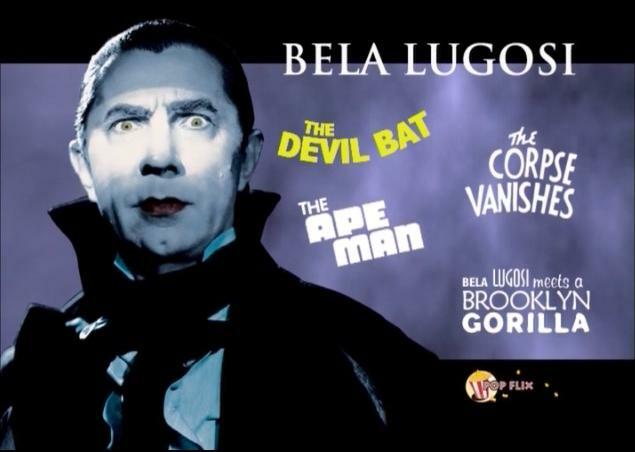 1952’s Bela Lugosi Meets a Brooklyn Gorilla finishes up Pop Flix’s Lugosi collection. Like Spooks Run Wild at the end of disc one, this is more of a comedy than a full-fledged horror film. I wonder if that was intentional? End each disc on a lighter note? The quality of the print here is easily the nicest of all eight films; crisp, clean, clear, with an actual richness and ‘depth’ to it. Which is a wash, because this is also easily the worst film on the set. It’s still entertaining, but it’s also painfully stupid. Like, really stupid. And keep in mind, we just saw a movie with Bela walking around all ape-like for the duration. Duke Mitchell and Sammy Petrillo are, uh, Duke Mitchell and Sammy Petrillo. They play themselves, nightclub comics who have crash landed on an island inhabited by stereotypical tribal natives. They also happen to be the dollar store versions of Dean Martin and Jerry Lewis. If you liked Martin & Lewis, odds are you’ll be severely offended by this ‘interpretation’ of their act. And if you didn’t like Martin & Lewis, you may want to take several steps back from the TV, because you’re liable to straight up karate chop it in half. Mitchell’s fake Dean Martin isn’t so bad, but Petrillo’s nasally Lewis-impression wears real thin, real fast. He makes the actual Lewis character look like Brando in comparison. I mean, Urkel wishes he could be this annoying. 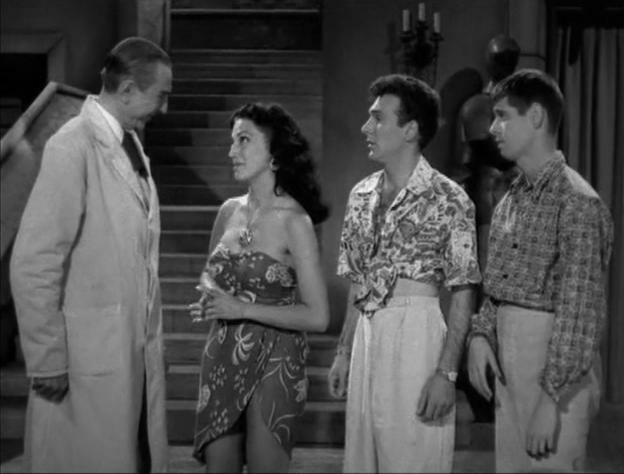 So yeah, fake Martin & Lewis are stranded on this island, fake Martin falls in love with a native girl, they eventually run into Lugosi’s “Dr. Zabor,” who is naturally conducting weird experiments. In a surprisingly unsettling turn of events, Zabor is in love with the same native girl, so he turns fake Martin into an ape, all while fake Lewis continues to be a total spaz. And it’s all capped off by a phenomenally dumb ending that will make you feel all the worse for sitting through the whole thing. In all seriousness, don’t think I’m not glad this flick is here, cause I am. It’s entertaining, but unlike the previous films, which were charmingly cheap entertainment, Brooklyn Gorilla succeeds as a slack-jawed, love-to-hate it film. It’s essentially harmless, and Pop Flix gets props for not going with the also-public domain and also-uber bad Bride of the Monster, but still, it’s markedly worse than anything else here. The other movies in this collection,it doesn’t feel right to call them out-and-out “bad.” Bela Lugosi Meets a Brooklyn Gorilla is bad. Entertaining bad, but bad nevertheless. Honestly, the set as a whole works, but this is the only movie I have any doubts regarding. It steps a bit too far out of the poverty row line-up we’ve enjoyed up to this point; even White Zombie doesn’t stick out as bad. Ghosts on the Loose would have made a better capper, but still, this is a nice, dumb way to finish things up. You know what’s neat about this collection? It spans 1932 to 1952. 20 years of Lugosi’s career. No, it’s not a comprehensive set; it mainly focuses on his 1940s poverty row material. Lugosi did make some films for Universal during the time period, but those are absent for obvious reasons. What Pop Flix has managed to do here is ably represent the Lugosi legend in more ways than one. Lemme explain: you start in 1932, he’s at the top of his game, and then you jump to the era of his career in which typecasting was in full, devastating effect: the poverty row cheapies of the 1940s. Then, you finish in 1952, the twilight of his career, where typecasting is still an issue, and the work is no longer A, or even B, grade. But, he’s managed to attain an almost a mythical aura; his name in the very title of the last movie here demonstrates that. He was legendary enough to receive such billing, even if such legend wasn’t recognized by the major studios. 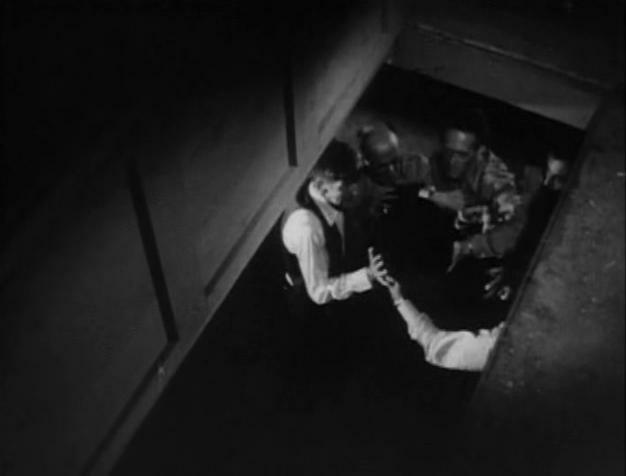 And the great thing is, Lugosi’s performance never falters. At all. In any of these. Sure, some (most) of these pictures were done more out of necessity than anything else. But, he got paid, they kept his name alive, and he gave them his all. You can’t help but respect him for not half-assing it, whereas, given the material present, most any other actor would have. Like I said at the start of this post, he absolutely elevates a movie all by himself. That’s a good actor. No, that’s a great actor. And he’s on full-display here. 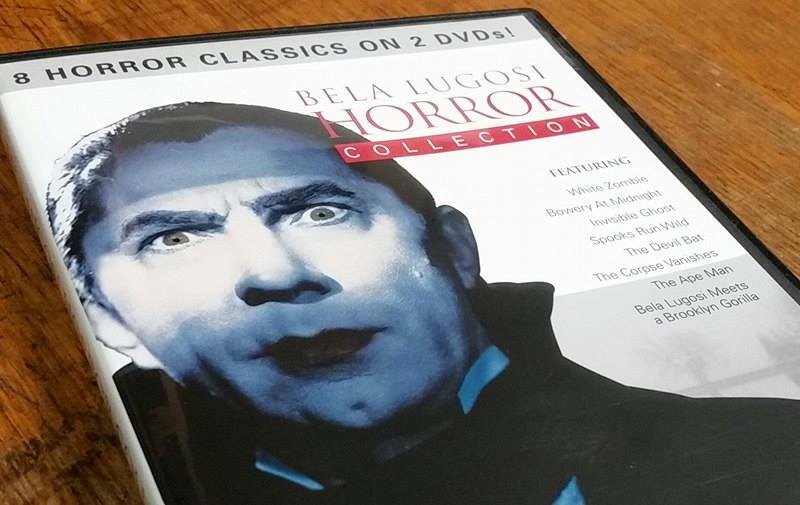 There are lots of budget Bela Lugosi DVD collections out there. A good many have any number of combinations of the same films seen in this one. But, I don’t think I’ve seen one that I’d enjoy as consistently as this Pop Flix product. At only eight films and two discs, that’s plenty of material without being overwhelming. And, it’s consistently entertaining, from start to finish. Even that last flick, as bad as it is, it still somehow works. For movies that have been circulating endlessly forever by this point, Pop Flix managed to do a great job with what they had. It all just clicks. It’s a set that’s far more satisfying than a budget DVD collection has a right to be. This entry was posted in Uncategorized and tagged allegro, allegro pop flix, allegro popflix, article, bela, bela lugosi, bela lugosi dvd collection review, bela lugosi dvd review, bela lugosi meets a brooklyn gorilla, bela lugosi review, bowery at midnight, budget dvd, budget dvd collection, budget dvd set, budget lugosi dvd, dracula, dvd review, dvd set, dvd set review, film review, films, horror, horror host, invisible ghost, lugosi, lugosi film, lugosi films, lugosi movie, lugosi movies, lugosi public domain, movie review, Movies, old, overview, pop flix, pop flix bela lugosi horror collection dvd, pop flix dvd, pop flix dvd reivew, pop flix lugosi review, popflix, popflix bela lugosi horror collection dvd, popflix dvd, popflix dvd review, public domain lugosi movies, public domain movies, sci-fi, spooks run wild, the ape man, the corpse vanishes, the devil bat, vintage, white zombie on July 27, 2016 by neovideohunter.